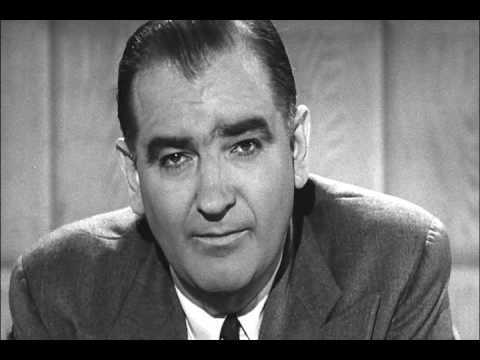 As the hyperbolic partisan non-dynamic duo flopped in their attempt to warn the country about the nation’s chief investigative agency being in “tatters,” their clownish antics provided a flashback to grainy black-and-white images from the 1950s, when Wisconsin Senator Joseph McCarthy had the same problem with English usage and the corresponding correct pronunciation for a proper noun. With their antics and constant taunting of the opposition, Gohmert and Jordan act like seventh-graders. We’ll return to the subject of seventh-grade a bit later, as I’d like to apply my scholastic experience in that formative year to assist with some conclusions about what might be lacking with these individuals. Although McCarthy has been dead for more than 60 years, the use of Democrat sans –ic is very much alive and used as a pejorative by snarly right-wing types to describe the Democratic Party. There is no doubt that Jordan and Gohmert, among others, are McCarthy’s presumed heirs in demonizing the opposition. What a difference the non-use of one syllable makes. It helps to identify those who are variously lunatics, ignoramuses, or simply discourteous by nature. Which brings us back to Gohmert. “I have never met, and I hope to never meet again, a man so pervasively astoundingly unyieldingly ignorant. To which I say, then you haven’t met Louie Gohmert,” Stephen Colbert observed several years ago. 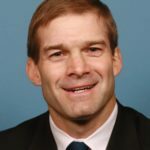 When it comes to describing Jim Jordan, however, the term ignorant is not used. Instead, there is a more damning explanation for the verbal behavior of someone who went to law school and sits on a House subcommittee dealing with intellectual property, including copyrights and trademarks. The presumption is that Democratic Party and Democratic National Committee are terms linked to copyrights and describe one of the two major political parties in this country. 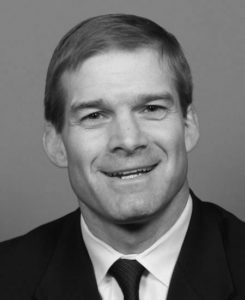 Surely, Jim Jordan, an attorney who sits on a the House Judiciary Subcommittee on Courts, Intellectual Property and the Internet, a body that deals with patents, copyrights and trademarks, would know that two names he continually mispronounces are legal entities whose names have been established, registered with their trademarks, and universally recognized. Surely, with his constant mispronunciation of the name of the nation’s oldest political party, no one has called him ignorant, unlike the characterization of his colleague, Louie Gohmert. No, but maybe the word or words to describe the Ohio congressman are much worse. The real reason ‘Democrat Party’ is wrong is not because it’s ungrammatical, but because it’s incorrect in another way—the party is simply not named the Democrat Party, but the Democratic Party. Calling it anything else is discourteous. Are you now or have you ever been a member of the Democrat Party? Are you now or have you ever been employed at the discredited, dishonest, tattered FBI? It’s bad enough when politicians, and in particular Members of Congress, show tendencies of lunacy and ignorance. But with Jordan, it’s more about the lack of courtesy and responsibility. It is certainly discourteous for Jordan to drop the last syllable of the name of an organization he refers to often that is a fundamental part of our political system. “Jordan was a terrorist as a legislator going back to his days in the Ohio House and Senate … A terrorist. A legislative terrorist,” Boehner opined recently in a Vanity Fair interview. Inevitably, with Jordan’s taunting of his opposition fresh in our minds, we are back to images of seventh-grade and what he should have learned in pronouncing proper names like the Democratic Party or the Democratic National Committee. In seventh-grade, my friends and I had a very demanding nun by the name of Sister Sylvia, who insisted that her students use mnemonic and other devices to remember basic information as well as how to correctly pronounce place names to overcome our distinct Philadelphia dialects. Armed with her iconic meter stick, Sister Sylvia demanded that we pronounce some words properly. “There’s no noise in Illinois, no cargo in Chicago, and no warsh in Washington,” she would have us know. As a stickler for accuracy in everything, if the good nun were alive today and if Jordan would be anywhere in the vicinity, I have no doubt that she would whack him with her wooden sword every time he uttered the term Democrat Party. In the case of Gohmert, she would need a box of those meter sticks to be kept in reserve. Yes, a Blues Brothers moment waiting to happen, and deservedly so. Several years ago, there used to be a commercial that aired in Columbus for a certain restaurant. “Never trust a skinny cook” was the punchline that touted the reason to dine there. In that vein, with Jordan and Gohmert, along with their other right-wing sidekicks, you also might be advised to never trust a career politician who cannot correctly pronounce the name of our nation’s oldest political party. No, if someone with a law degree cannot pronounce the names Democratic Party and Democratic National Committee correctly, that person shouldn’t be trusted due to being a lunatic, ignorant, uncivil, discourteous, or irresponsible. Thanks to Stepehen Colbert, we know which descriptor fits Louie Gohmert. Choose which of these best describe Jim Jordan. Hint: you can choose more than one.